Send a dynamic message in any living space or bedroom with this burnt walnut and silver rectangular wall mirror. Delivering a dramatic and exotic vibe with richness and texture, this gorgeous mirror from Uttermost is a must-have for updated transitional spaces. Crafted partly from iron, its rectangular frame features raised triangular detailing made more intriguing with a deep burnt walnut stain finish and silver leafed iron inner liner. This burnt walnut and silver rectangular wall mirror is a timeless element in stylish room design. 44" wide x 75" high x 3" deep. Hang weight is 92 lbs. Glass only section is 29" wide x 60" high. Surrounding frame is 7" wide. Beveled edge is 1 1/4" wide. Glass thickness is 5 mm. 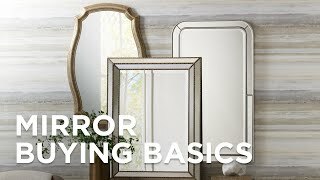 Rectangular oversized wall mirror from the Uttermost Aperia Mirror collection. Burnt walnut stain finish with silver leafed iron inner liner. Firwood, MDF and iron frame construction.